Large induction motors are very sensitive to unbalances in supply voltage. The negative sequence component, which comes into picture because of the unbalance in the supply, is particularly troublesome. 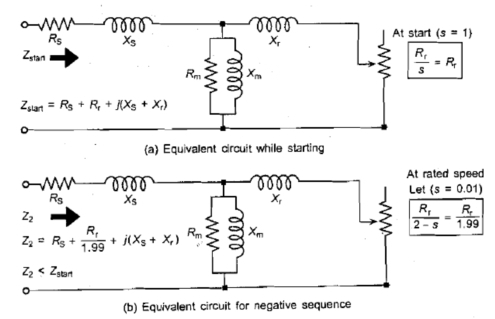 This is because the motor offers very small impedance to the negative sequence currents. In fact, the negative sequence impedance is less than the positive sequence standstill-impedance as shown in Fig 1. Thus, a 4% negative sequence supply voltage causes more than 24% negative sequence current to be drawn by the motor, if the starting current of the motor is six times the full-load current. This causes increased heating of the stator. Further, the magnetic field due to negative sequence rotates at synchronous speed Ns in a direction opposite to that of the rotor which is rotating at a speed equal to (sNs), which is slightly less than the synchronous speed, where s is the slip of the motor. This causes currents of [f(2 - s)] frequency, i.e. almost double the supply frequency, to be induced in the rotor circuit. Because of skin effect, the rotor offers five to ten times its normal resistance to these double frequency currents, thus, causing excessive heating of the rotor. Therefore, for large motors any unbalance in the supply voltage needs to be quickly detected and corrective action taken. A scheme for detecting unbalanced supply voltage is shown in Figure 2. 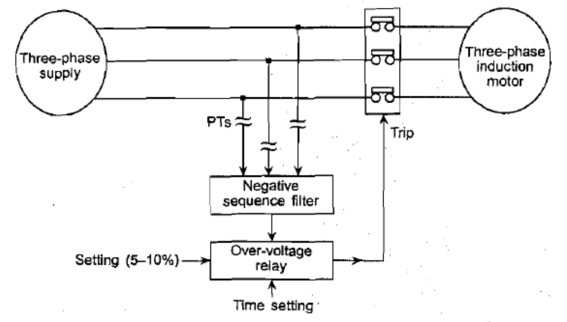 There are certain situations where the negative sequence relay does not operate correctly. For example, if there is an open circuit fault between the supply and the relay then the relay measures the negative sequence voltage across the motor, which is substantial and, therefore, the relay operates correctly. This is shown in Fig.3. For positive detection of such faults, we need to detect the negative sequence component in the line currents.